WordPress is a fine platform for building websites for schools. And, you have lots of options. This can be a website that works like a brochure that gives information about the school, a website where students can see their student information, or a full online school where students can log in and take classes through the website. It doesn’t even have to be a full school. It can be anything from a site where you provide a few classes or it can be a full-blown college. Whether you’re creating a school for a single teacher or a staff of college instructors, WordPress has everything you need. Information only – this is a brochure that tells about the school and the courses and classes. It’s the same as a printed catalog. Membership site – this is a site where students and faculty can log in and see their grade information, submit homework, instructors can manage courses that take place both online and offline, and where students can take the class online. Regardless of whether or not the school site will be a membership site, the information portion is the same on all types of school websites. To build a school website, this is the best place to start. Online courses will be added to this. The brochure-style site is just a simple matter of setting up the pages listed above and choosing one to be the home page. You will then build your navigation structure and upload all of the necessary documents. The school brochure will be the backbone that you build from. Taking that into the realm of online course management and online courses, you will need plugins that will help you create and manage the courses, allow students to enroll and provide the means for instructors to evaluate student’s work, receive payments for the classes, and provide a delivery system for the classes. By far the best way to do this is with a plugin. Plugins for schools have various functions. Some focus on student management, others focus on course management, and still others focus on providing a platform for the online class. Some only provide a way to add classes to your site without creating a full school. What you need, of course, depends on the kind of school website you want to make. If your school will never provide classes online, then you won’t need to bother with a plugin that offers that feature (unless you just like the management features better). However, if it’s possible that you will one day offer online classes, then I recommend starting with a plugin that does provide this functionality and just not use that feature until you need it. 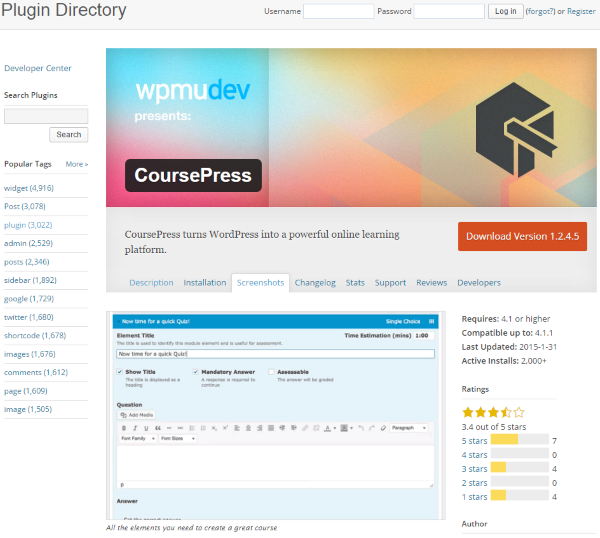 This way you will be able to use the same plugin for course management as you do for the class delivery platform. You could use a conglomerate of plugins/platforms together to build your school. For example, you can combine the selling functionality of WooCommerce with the classroom functionality of Moodle with the CMS functionality of WordPress. This conglomeration might be your best choice if you already use WooCommerce and Moodle, but a simpler choice would be to use a plugin that handles everything in a single package. This is known as an LMS (learning management system). Here are a few plugins that can provide just the basics or an all-in-one platform. This free plugin is a course management system. It adds two tabs to your dashboard: course and publications. From the course tab you can create courses and student accounts. You create a new course by filling in all of the general information including course name, description, dates, room, instructor, and an image. You will also create student accounts from this tab in the same way. Once you’ve created the course you can select it and add documents, enrollments (see who is enrolled and add students to the course, send email, and export the list), perform assessments for each student, and user capabilities. This is where you describe the publications that will be used for the course. It can be a book, booklet, article, chapter, presentation, online, etc. You fill in all the information and provide links if available. You can import and export documents and you can add them to your list of publications. You create the page for the class using a shortcode. A button is added to the visual editor. When selected, it will open a drop-down menu where you can choose which shortcode to place on the page. You can add a shortcode for courses and publications. For courses it will give you a list, documents, information, and an enrollment system. For publications you get a list, tag cloud, and a search. Selecting one will give you a pop-up where you can choose the details you want. I like the look and feel of this plugin. It does a great job of providing info for the class and allowing student to enroll. The focus of this plugin is course management. It’s very easy to use. 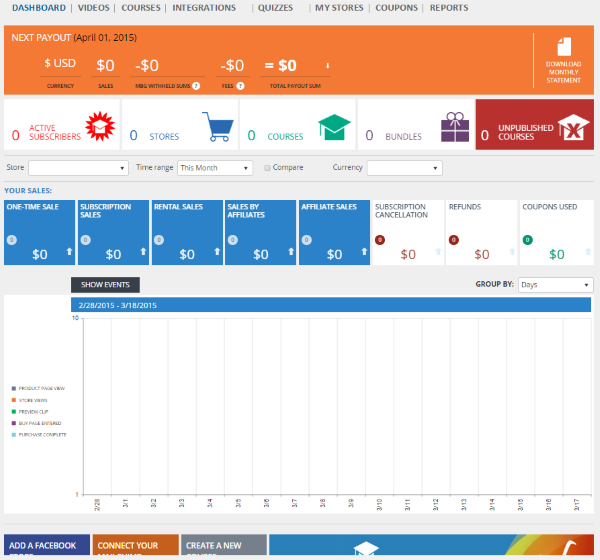 This one lets you set up online courses with learning units that you can sell. You can utilize quizzes, video, audio, assess student’s work, and more. Everything you need is here to provide free and paid courses. It gives you lots of control and functionality including adding and managing courses, categories, instructors, students, assessments, reports, notifications, discussions, and more. 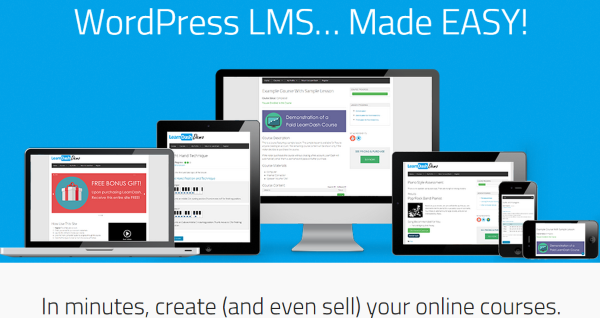 To sell courses you will need a plugin called MarketPress. It comes with example courses already created. You can delete them or edit them to make your own. To create a course you fill in all the information for the course overview, description, instructor, dates, classes, discussions, workbooks, enrollment, and cost. You can have live chats, a complete discussion board, audio, video, and course previews. You have to set up the structure of the pages yourself using the shortcodes. You can set attributes for each of these items. With this level of complexity you can create advanced course platforms. This also makes the system more difficult to learn and setup. 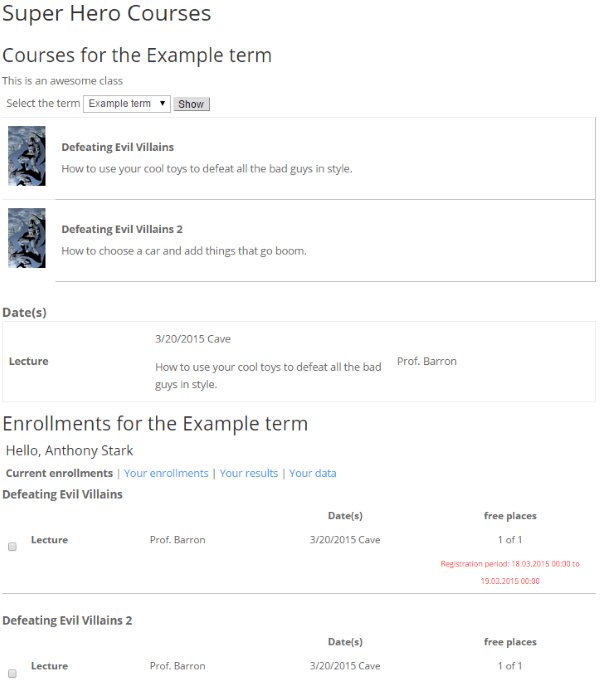 It also includes widgets for the course calendar, categories, and course structure. It works and looks great, but it is a lot of work. The free edition limits you to two courses. There is also a pro edition that costs $19 per month and includes unlimited courses, unlimited downloads, unlimited sites, and support. This one lets you create video-based courses that you provide to your students- providing both course management as well as course delivery. Billing, hosting, and security are provided by LFE and integrated into your WordPress site. You can provide classes on your site or turn your site into a complete school. It can be integrated with Facebook, MailChimp, and with your own store. You have full reports and stats. LFE gets 15% and you get 85% of the sale. The dashboard is intuitive to use. 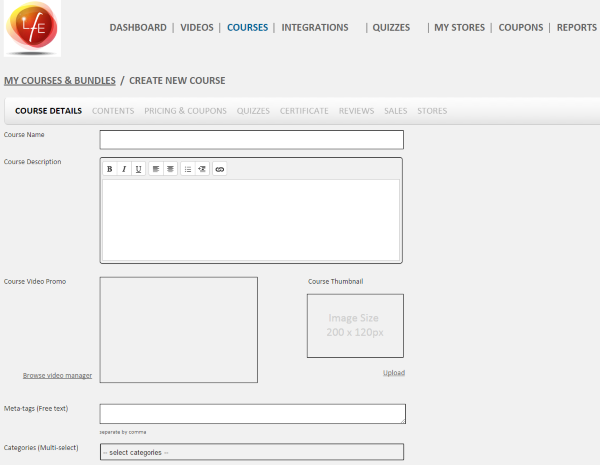 From here you can create courses, quizzes, coupons, upload videos, create a store, and view reports. 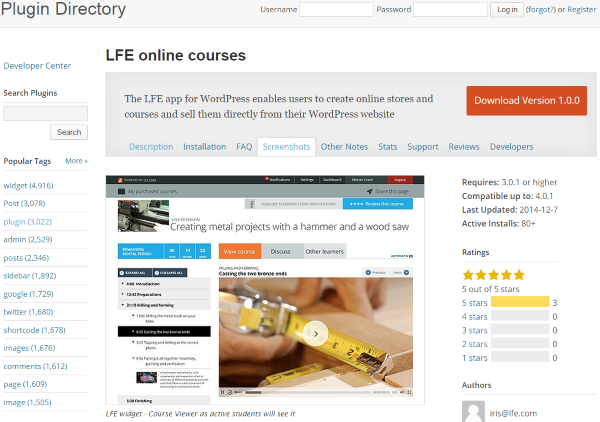 You create the course from the WordPress dashboard. You add all of the descriptions, content (video), pricings, quizzes, certificates, coupons, etc., and then you are ready to publish. Although the course is hosted be LFE, it is integrated into your WordPress site so your visitors never leave your site. You can even import your courses from Udemy if you want. I like the way this platform works. You create the course but you don’t have to worry about hosting the course, handling payments, or your visitors leaving your site. There is a lot involved in creating a course, but it is intuitive, so there’s no learning curve to slow you down. This one is a complete course management and delivery system. It has a nice system for creating courses and it looks great. The courses have a ratings system so students can rate their experience. The courses show a progress bar so students will know their current position within the course. The course itself can be a mix of text and video. As they go through the pages, the progress will change to follow them. At the end of the course they can take a timed quiz, which can be a combination of multiple choice and written. There is a certificate and badge system so you can choose the type of award students receive upon completion of the course. You can see this in the demo. There are several different payment methods including PayPal, Stripe, Paymill, Authorized.net, bank transfer, etc. You can even have onsite courses and just use the system as a means of payment and course tracking. It even has commission rates for instructors. The plugin costs $30 for use on a single site. This plugin has tons of features including the ability to easily create courses, modules, and units. There are lots of features for quizzes such as time limits and various question types. It has unlimited modules, courses, and units. It includes all of the student management features you need such as enrollment, grade tracking, course tracking, notifications, etc. There’s even a survey tool so you can get feedback on your courses. It integrates with other e-commerce and membership plugins to handle payments. It has a demo where you can see how it all works. With this one you can create courses, modules, and classes. You can add text or video for the class itself and you can publish a course just like you do a post or page. You can drag and drop units into modules to create courses. You can place modules into pages and posts by using shortcodes, or you can use the widget to place them in your sidebar. It works great on mobile devices. It’s simple to use, but having to integrate an e-commerce solution for payments will take an extra step after the install. This one is a premium plugin that costs $99 for 2 licenses, $125 for 10, and $175 for 25. 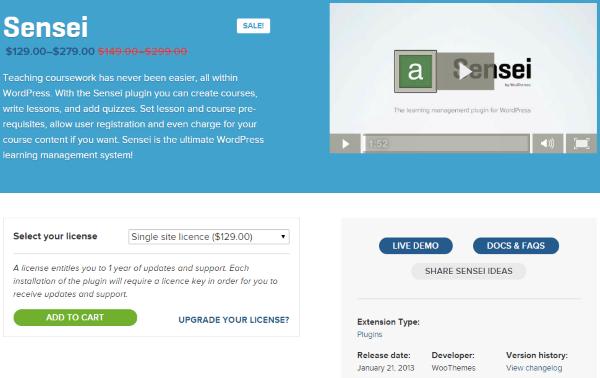 Sensei from WooThemes integrates perfectly into WooCommerce to create a nice online course platform. It uses a custom post type called Lessons. You can create courses, lessons, and quizzes, and you can set prerequisites for courses and lessons. It uses WooCommerce (surprise!) as its payment platform, which treats a course as a product. Since it uses WooCommerce, you have full access to all of the e-commerce features that WooCommerce offers, so you can have coupons, special sales, etc. It includes virtually unlimited quiz types, easy quiz grading, and a question bank. Course analytics provides an overview of content, quizzes, and registered students. It provides course progress, certificates, badges, and students can share their grades on social networks. Courses can be onsite, or online with video, audio, images, and text. You can provide materials through media attachments. The course can be reviewed by students. There is a demo site where you can see the structure and look of the courses. The demo uses a combination of text and video that looks sharp and the navigation structure is easy to follow. It works with any theme and costs $129 for a single site license, $179 for 5 sites, and $279 for 25 sites. This one allows you to use any kind of media to create and deliver your courses. The sales platform is built in. It includes forums that can be private or public, and course specific. You can set prerequisites and have multitiered courses. It has lesson timers, advanced quizzing, group management, multisite, and tons more. It is responsive and works with any theme. 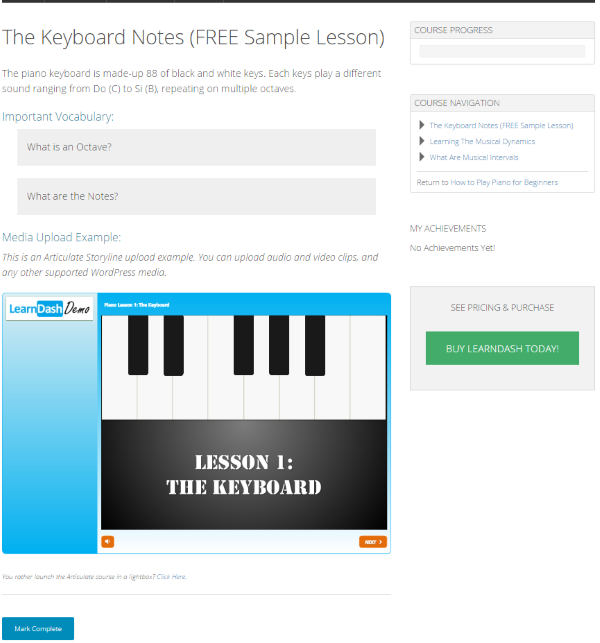 There is a demo site where you can see what lessons might look like. The lesson structure looks smooth and easy to navigate. It has a nice course navigation feature and a progress bar. 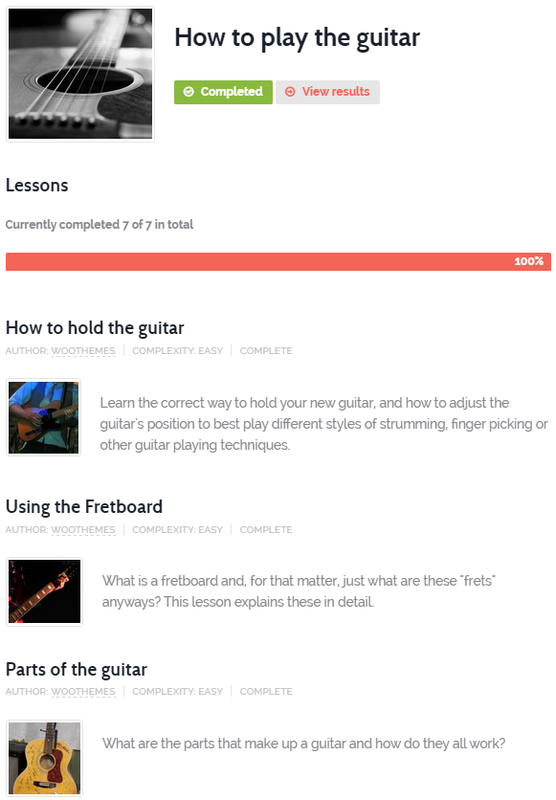 You can see the course content, take the quiz, and see your achievements. You can set a simple or complex hierarchical structure for the courses, and it will label them as complete before allowing students to continue through the course. This is a premium plugin. The Basic package is $99 and includes an unlimited license with 1 year of support. The Full package is $129 and adds the pro panel. Whichever type of school website you choose to build, whether it’s information or a complete online school, WordPress has the tools you need to make it work and look great. You can add courses to your site, create a complete school navigation structure, or create a site with information about the school. Your turn! Have you created a school website with WordPress? Did you use one of the plugins I discussed here? Did I leave out your favorite? I’d like to hear about it in the comments below! you are really amazing.your article is very easy to understand. I am going to recommend this article to one of my friend because he is very much interest about this subject. Thanks for the tips. 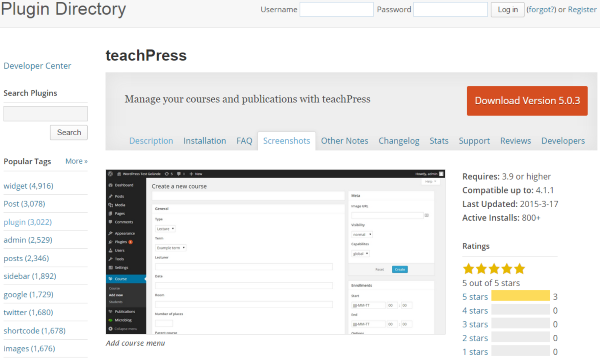 I have not built a school website yet, but if I once do, I will probably use the CoursePress or the Good LMS plugin. Thanks for links to useful plugins! Thanks for another great resource. I recently built several school websites with WordPress and one of the clients now wants a full school management portal. I was wondering if you (or anyone else) has any experience building something like this. The Ekkator plugin http://codecanyon.net/item/ekattor-school-management-system-pro/6087521 looks like it could achieve my goals but I’m wondering if there are any other options as this seems to be the only plugin of its kind. Yes Adam, this is the type of plugin that meets offline tradition schools for college/secondary schools (in Nigeria) and not LMS that offer course sales online. I’ve been looking out for a WordPress plugin that can accommodate features in EKKATOR for tradition schools that need to administrate or run school as the way they do offline but thinking to of hiring a plugin developer to custom build one recently. However I loved CoursePress Pro because she nifty, smooth to use and extensive but not for traditional schools like those featured in Ekkator. Thanks Adam for revealing this but how will you integrate it into WP or are you planning to set the school off WP software? Could you please share with me your school website urls? Also, kindly let me know which plugins you used & where should I start. I want to be careful that this gets presented with the intent I have in mind, which is not to solicit work but to advise and provide a little perspective. I have built a Data Engine that actually recapitulates WP and uses it as a plugin to centralize admin and provide one of the best web publishing and CMS platforms. My system is geared toward Online/Interactive Course Management, including secure content delivery to Members Only, but it also allows searchability, only restricting the actual payloads… I have offered this since 2011 for private commercial contracts and I have had great success- especially now that I’ve developed on 2 or 3 different ElegantThemes to offer better flexibility for the front end. I have to say that the reason I built my software was to address the fact that so many other options do not integrate fully as an institution- or entrepreneurs who are content marketers- often need and find with my system which is fully integrated and includes transactional mail (Mandrill) so that everything from Soup to Nuts is managed via the WordPress dashboard, and simply as possible which means that ordinary clerical administrators can easily intuit how to use it. In my opinion, a very, very small operation will be served by several of these plugins, but just like the mess with the Calendar/Appt. plugins, once you experience the 1st degree of complexity suddenly the capabilities become very hit & miss as to how they perform and whether they can ever meet the actual needs of the business or institution. Caveat Emptor. I assume these plugins are fully compatible with your themes? Or do you have a theme that works best with these plugins? Not trying to play devil’s advocate here, but speaking from experience, these blog posts by Brenda are “I researched a number of plug-ins and present you my results here”. They are not: “I did extensive testing with all of these plug-ins with all the themes Elegant Themes are offering and I can recommend every single one of them”. There have been blogs on this post talking about buddypress and mentioning Divi despite buddypress not being too compatible with the plug-in (out of the box). I know that all that research is still lots of work and putting it all together in a blog post, so I’m not trying to take anything away from Brenda’s work; I appreciate the hard work that goes into these posts. I’m just trying to make sure no one’s getting the wrong idea here. I embed BP shortcode in Divi and have yet to encounter any issues. Can you give an example of your experience? CoursePress Pro isn’t compatible with Divi outta box because of its virtual page coding used by WPMU developers to view the courses. However, I still used CP Pro by setting up a multisite and using Divi to power the front-end and CoursepressPro powered the course pages hence, merging the two dragons together with a single login. 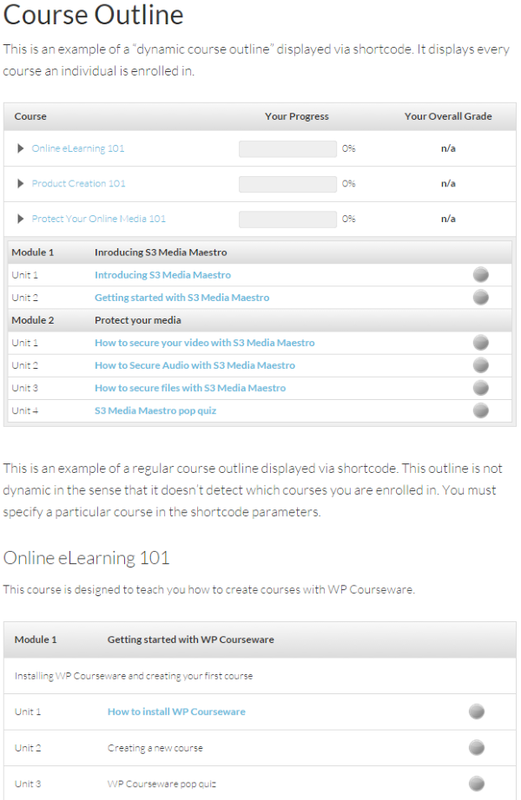 In addition, I think you can use CP shortcodes to create the course pages but can’t vouch for it. Besides, I was using LearnDash initially, though took some time to get the creating of courses, I eventually set up courses, and it was looking all good even when the front-end part isn’t so impressive. But having when i start glitches (permalinks palaver, courses not found) and support wasn’t forthcoming promptly and exact, I switched to CP Pro which came at the nick time and save the day somehow. I’ve not tried WPcourseware nor the Goodlayer plugin on Divi. This is a very smart approach and let this be a indicator of what it will take in the real world to deliver on a business model that works, given that everyone’s business model and it’s needs will differ even if you compare 2 brick and mortar schools, or 2 online universities… it will take expert development to massage the issues and bridge the gaps. Having a set of tools available to create something workable is light-years ahead of where things were before WP and themes which are performant, feature rich, and well coded enough to stay out of the way when complex plugins get involved. GREAT……what a timing…..on d way to creating school websites……. And This is going to help a lot to make a better product…..THANKS. One special requirement, is there any way that I can include course list in my contact form 7 as dropdown.???? 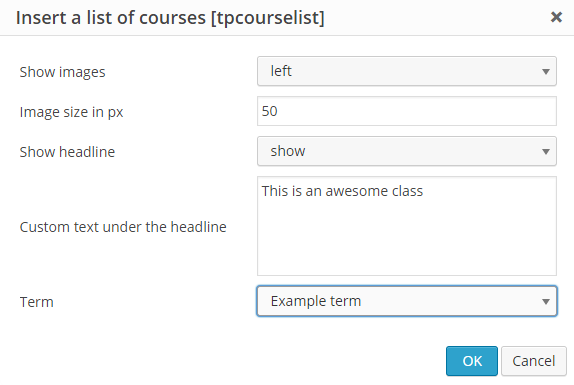 So that if admin adds a course it will show automatically in the contact form in course list dropdown. Thanks for this article I’m building a website for an educator that is starting her own school. I believe being able to offer these online course will be a bonus for her students. I think you need to take another look at your site. Because on Android the photos are way stretched out. I think in this day and age you should really make it compatible for mobile. Thanks for the overview. I have a client interested in building an online portal for their courses and this added to my knowledge bank for the project. It’s not quite what they want though, but at least now I know what an LMS is and isn’t. Hey, thanks Brandon, that’s thoughtful! I’ve been looking for a way to set up a dedicated school portal on WP but plugins I’ve seen online are for course sales/lms and most traditional schools are not operating in this level at the moment except developers/WP power users selling courses. However, I’ve used LD and CoursePress Pro but preferred the later because of its ui/ux. Great article. I’ve been very busy migrating public-facing district and school web sites from expensive, proprietary, closed-source SaaS solutions to WordPress. This is saving millions of taxpayer dollars a year. The beauty of moving to WordPress is that the district can then start thinking about moving all of the other third-party systems to WordPress as well, for a fraction of the cost. Things like Student Information Systems (SIS), courseware, classroom pages, online forums, video-based professional development systems, LMS’s, etc. can all be built out on top of WordPress quite easily. For some of these things, the work has already been mostly done and it’s just a matter of installing and configuring a plugin and doing some basic data migration. Excellent post, just what I was researching on for my next project for an online video learning site. I need to start working on this project soon. So your recommendation would help. Does WP Courseware support selling part also. I will alao test the plugin, but your green signal would really help. One plugin I didn’t see in your article was Namaste! LMS. Did you get a chance to review it. Do you have an email id to send an email to? Thank you for this article. We recently built our site using Divi, and I really like how active Elegant Themes is. I will definitly be buying a lifetime membership. I have been researching several LMS and I’m trying to find a way to create a landing page for a student once they are logged in. I am wanting to display their available lessons at the top and then below that a list of lessons that they can still purchase (ideally with something like the Divi portfolio module). I’m having trouble finding anything that can do what seems like this simple thing AND also be able to allow multiple levels of membership (so students can own more than one lesson at the same time). This seems like a very common thing that I see often, but I’m not able to figure out how to get these LMS to do that. Any advice? Please could you give me the Course URL you mentioned in the article (link missing). Great article. One question, do any of these LMS allow students to upload papers with assigned due dates? I have used Sensei like ~year ago, it’s great plugin and it allows students to upload papers. I believe you can set due dates also. Hi Brenda, thanks for the post, is a very useful information. I have an online academy, http://www.nubemia.com (only 2 months year old 😉 and only in spanish language), and i have built with sensei plugin. This plugin is a very good plugin, the integration with woocommerce is total, i had a minor problem with my theme, but i only had to change the wrapper end file to adjust the sidebars in the lessons page, you can read about this info in the documentation of the plugin. 1. If you want a platform where other teachers can sell their own courses, that is a problem because the teacher’s profile is not well thought, and you can see and edit all the courses, not only yours. 2. You can’t create privates forums, however it does allow comments in the lesson pages that can only see another students enrolled in the course. I think that is a great plugin and i hope they solve these minor inconveniences in future versions. Greetings! We used Divi to create our Lutheran School website (Immanuel Lutheran in Palatine IL). Using Divi made it a lot easier. All of the comments/questions on the Divi forums and the Divi tutorials and Blogs helped a lot! Thanks everyone. You can check it out at http://www.ilcpschool.org. Great themes, and I really wish I had gone into teaching. These blogs would make great learning tools. They can also help parents keep up on what’s going on in the kids’ classes, too! I would add an announcement bar for school closings due to weather. As a parent, it is the #1 reason to go to the school’s website. I prefer Sensei for school website building mainly because of its features like video courses, quizzing and awarding certificates and badges to students for their achievements. The other positive factor with Sensei is its easy customization and seamless integration with existing websites without altering the current functionalities. Hi Brenda, your post is very useful and helpful to me. I am new to this online world and want to know about it. I am planning to start a small school and all of your contents are very useful. one more thing I want to know – about the result. How can a student view exam/test result using his/her roll number. I am new to word press. I am working on creating a student management system using word press. Create / edit / delete login for students, parents and teachers. Can you please suggest if there are any plugin available for the above features or any plugin which I can customize to build the above features? Great write up Brenda! 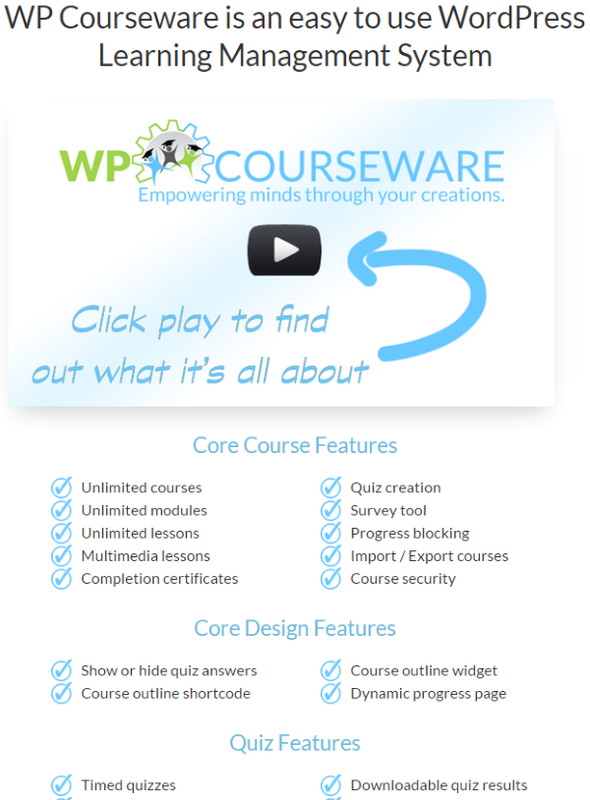 Thank you for including WP Courseware in your round up! We are super excited to be a part of the fast growing WordPress e-learning community. We have some really cool updates coming up as well as a new product that will help to increase course sales. Great Article for creating a website for school. I suggest you, for seo purpose you should add all in one plug-in for visibility. Hi, Thanks for sharing such a great information. I am new at wordpress development And I wanted to take help regarding online course teaching website i am working on it… I am trying to get everything done free. So now I am looking for any free plugin etc that could help me to check the student’s progress in the course. can anyone please help me to find such plugin etc for my wordpress site? I’m using CoursePRess to create some awesome courses of photography. But, I have a doubt, do yo know if COursePress use post of pages if you create every unit? and, how can I select one of them to start creating units? I don’t know if you can help me about this but I’ll be very greatful. I am looking for a plugin that is more oriented to membership management than courses management. I need to add parents and kids, classes, and need to send mails to parents related to a specific class etc… which plugin would you recommend ? I am trying To integrante a lama with magic member plugin so than I can keep the payment Easy. All the plugins seems like good. Can I try them and delete if It do not work as expected ? I am afraid to mess up my website! I appreciate your post it’s near to what I was looking for except that I was looking for a plugin to help me create a membership website for a school where the students can have access (download link) to check their academic results online privately/independently via the their profile page. I also need a wordpress plugin that can help me create a membership site for schools where the students can access their academic results generally or privately with the use of voucher/scratch card.